Waking up after a night of drinking with a nauseous hangover that leads to vomiting bile can be an extremely unpleasant feeling. Excess consumption of alcohol dehydrates the stomach that leads to digestive fluid refluxes which are commonly known as bile refluxes. This article discusses the symptoms of hangover throwing up bile, goes through the causes behind it, practical tips on what to do when vomiting bile, the dangers attached to it, and when to seek medical attention. In what way does hangover cause vomiting digestive fluids? What are the signs and symptoms of vomiting bile? What causes throwing up yellow as a negative after effect of drinking? What are the dangers of throwing up liver fluids as negative drinking aftermath? What to do in case of hangover vomiting bile? What are the signs one immediately needs to see a doctor? How Does Hangover Cause Vomiting Digestive Fluids? Out of many negative gastrointestinal effects that happen after one too many drinks, vomiting bile in the morning is surely one of the most uncomfortable things to happen. It is natural to be curious about what is bile when you throw up after a hangover. In includes digestive liquids which back up into the stomach, up the esophagus, and into the mouth. 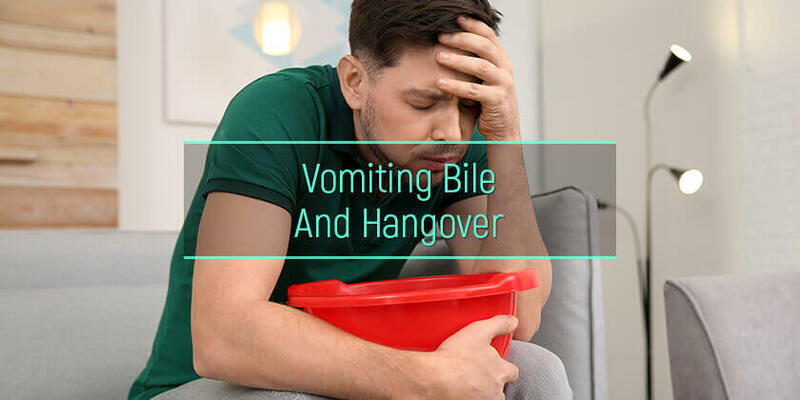 According to a study by Colorado State University, the act of throwing up yellow bile hangover is the result of a series of events that happen during a hangover episode. The main cause of queasiness that comes after drinking is the irritation or the inflammation caused by alcohol to the stomach lining. As a result of it, the stomach produces excess fluids or hangover bile which leads to stomach pain, feeling nauseous, retching or dry heaving, eventually leading to the act of vomiting. Symptoms of puking bile hangover are different from nausea that happens because of food poisoning, motion sickness, pregnancy or having a stomach infection. Bile reflux is different from gastric or acid reflux that includes stomach acids as opposed to the digestive fluids produced in the liver. Following are some of the signs of hangover bile reflux. Understanding the symptoms of bile reflux helps to be conscious of the severity of the situation and medical attention when needed. Therefore, if one experiences hangover throwing up yellow bile specifically, it should not be ignored. The main cause of vomiting bile after drinking alcohol is the severe dehydration and irritations caused by alcohol to the stomach lining. This makes the digestive fluids (bile) produced in the liver back up or reflux into the stomach, along with the esophagus and into the mouth causing the person to throw up. Having an empty stomach while suffering from veisalgia, especially after a night of not having a proper diet, can also induce vomiting digestive fluids, since there are no other contents in the stomach to throw up. Cholecystitis is a condition that occurs as a result of inflammation of the gallbladder – the organ that holds digestive fluid. Those who have Cholecystitis and other liver-related issues also throw up digestive fluids and show similar symptoms to hangover induced nausea which should not be confused with each other. Any kind of nausea is a cause for concern, especially when it comes to repeated throwing up bile after hangover. It is important to understand that throwing up digestive fluids can happen simply due to having an empty stomach, which is not dangerous. However, when it becomes excessive and happens as a result of a hangover with vomiting bile, there are several dangers of a hangover to be expected. Especially, if it happens quite frequently and lasts even after when there is no hangover. Alcoholics are also highly prone to vomiting blood after drinking alcohol because of the ruptured esophageal veins that occur due to frequent vomiting bile hangover episodes. Speaking of the extremes when it comes to these dangers, it is unlikely to die from a hangover. Nevertheless, regular hangover vomiting bile should not be overlooked or ignored since it can cause long term damages to the esophagus and the overall health if not managed or treated. What To Do After Throwing Up Bile? Treating the severe dehydration of the body that happens after throwing up bile from drinking should be the first thing to do after an episode of nausea as an aftermath of drinking. This is particularly important when it is coupled with diarrhea after drinking alcohol day after. What to drink when vomiting bile? Clear liquids such as water, mild fruit juices without pulp, and fresh broths are the best things to drink after vomiting. Avoid citrus drinks and milk since they can be hard on the digestive system after a vomit bile hangover. It is important to intake fluids in small amounts that gradually increase to not to irritate the stomach even further. If nausea has lasted for over 24 hours, it is recommended to get an oral re-hydration solution or take medical attention which will be discussed in-detail later. What to eat when vomiting bile? After experiencing a throwing up bile hangover, it is important to be careful with the diet to recover and regain the strength quickly. Avoid food that is hard to digest. Remember to eat slowly while chewing well to help the weakened digestive system. It also helps to eat food that is not too fragrant or flavored and is at room temperature. Immediate medical attention should be given if there are any of the following signs especially after repeated throwing up bile hangover. Some people experience an inflammatory response due to excessive alcohol consumption that is commonly known as hangover fever. If nausea is coupled with fever, muscle aches, and headaches, immediate medical care is needed. There are also some connections between vertigo and vomiting bile since alcohol and nausea can trigger vertigo symptoms. In conclusion, prevention is always better than cure when it comes to nausea and alcohol-related medical issues. It is easier and healthier to find ways to prevent this situation from ever happening rather than trying to find answers to the question of how to stop vomiting bile after drinking. There is a notion out there that throwing up helps the body when getting over negative alcohol after effects. Does throwing up help a hangover? The answer is no; it does not. By the time the body experiences the “hangover” symptoms, alcohol has been completely metabolized in the system. Throwing up only gives a temporary feeling of relief and further dehydrates the body. Keeping the stomach full and the body hydrated is the first step to preventing nausea after drinking. It also helps tremendously to recover faster in case someone has to seek how to cure a bile hangover after a night of drinking regardless of any precautions. Keep hydrating the body even during alcohol consumptions to help the body manage the blood alcohol levels. Treating alcohol addiction is although hard but highly possible. Seek help in alcohol abuse rehabs and start a new sober life today.